You can donate by text. 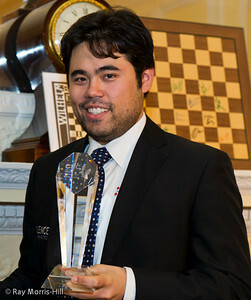 26-year-old US grandmaster Hikaru Nakamura of the USA has won the 5th London Chess Classic, staged this year as a rapid chess tournament and billed as the Super Sixteen Rapid. The top American grandmaster defeated former world championship finalist Boris Gelfand of Israel by 1½-½ in the final. As the world number four on the FIDE Rating List for classical chess, and number three at rapid chess, the result was far from being a surprise but it was a significant achievement in the career of a remarkable player who must be a leading contender to threaten Magnus Carlsen’s world crown in the next few years. Hikaru’s progression through the competition was impressive. He scored +2, =4, -0 in the preliminary phase, and then improved that to +3, =3, -0 against sterner opposition in the knock-out phase. To go through without a loss was a clear sign of strength. Tuesday 10 Dec: The Pro-Celebrity Challenge saw stars of TV, music and sport team up with the grandmasters to face off against another pro-celebrity team. Games were played with 10 minutes and 10 seconds on the clock and broadcast live. Lawrence Trent and Malcolm Pein officiated. Play through the moves of each game! And today, we are pleased to announce that during the Classic, we will also be hosting the Chess and Education London Conference on the weekend of 7th and 8th December 2013 at the Olympia Conference Centre, Kensington. Titled “Successes and Challenges: Improving School Chess Practice, Research and Strategy,” the conference will bring together like-minded promoters of scholastic chess from Armenia, Sweden and Denmark, who will highlight the latest success stories of their work in the classroom, as well as recent research and commentary from eminent scientists, academics and authors. 15.12.13 - Hikaru Nakamura of the USA and Boris Gelfand of Israel have qualified as finalists of the Super Sixteen Rapid at the London Chess Classic after an exciting afternoon's play at the Olympia Conference Centre, and the most dramatic of conclusions. The final two-game match between them follows at 1730 UK time this evening. Read more. 15.12.13 - The Super Sixteen has now become the Super Eight and Saturday’s exercise saw the eight whittled down to four. One of the curiosities of this tournament is that, despite the alleged ‘randomness’ of rapid chess, all eight top seeded proceeded to the knock-out stages at the expense of the rest. With all the quarter-finals being between players who were fairly close together on the rating, there were no real surprises there either. Another thing to note is that three of the semi-finalist have an average age of about 40. Links to all our 2013 London Chess Classic reports are here. CSC ran their popular one-day courses during the Classic. These courses were designed for teachers, mentors and parents who are involved in school chess. 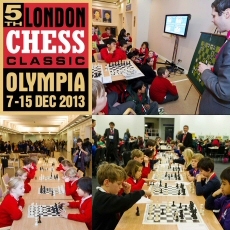 The 5th London Chess Classic takes place at Olympia from Saturday 7th December to Sunday 15th December 2013. CSC school events at previous Classics have proved great successes and we are pleased to announce that we shall be running them again this year.